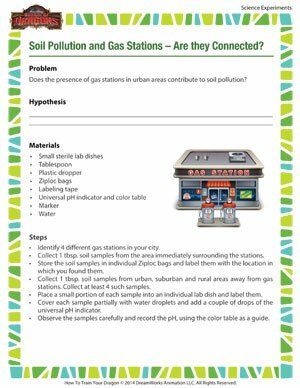 Home > Resources > Soil Pollution and Gas Stations – Are they Connected? Most of the modes of transport we use run on gasoline, so naturally, a gazillion gas stations have sprung up to meet the very pressing need for fuel. But don’t they contribute to soil pollution? Here’s your chance to find out – print this free science experiment and get started! There are loads of interesting science experiments for all grades at the School of Dragons.